Used to show all of the published Contacts in a given Category. Note that Contact Categories are separate from Article Categories. Contacts and Contact Categories are entered by selecting Components/Contacts. See Contact Manager and Category Manager for more information. 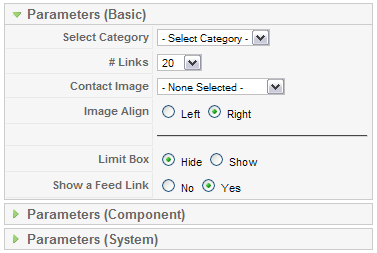 The Contact Category Layout has the following Basic Parameters, as shown below. # Links. Number of contacts to show. Contact Image. Image for this Page. Image must be located in the folder "images/stories". Image Align. Align the image on the left or right side of the page. This page was last modified on 13 July 2010, at 09:26.